Beneath the roadside canopy, Dante squinted hard. Relentless sunlight reflected off the broad expanse of roadway and speeding cars. With his good hand, he grabbed the twenty pound sack of oranges by its red mesh neck. He hoisted the bulging bag over the battered folding table and into the arms of the waiting customer. The man corralled his impulsive young son between his legs and the table while he held out a paper bill in return. “Flores, Seńor?” He pointed to multi-colored bouquets of roses standing in plastic tubs. Speak English. So hot. So tired. So hard to remember to speak the language of his unhappiness. “How much?” The man tapped his fingers, impatient. “Seven dollars. Ten for two.” Dante tried not to squint but the customer was just a shape against the sun. Dante squatted by the bucket and struggled to get hold of two bunches of roses with his left hand, his remaining good hand. But he was right-handed, so the left one wasn’t all that good. Angry, he flexed his maimed fingers what little he could. They were hidden in the pocket of the tattered pea coat he wore every day, even when it was ninety degrees outside like today. “Can I help you with that?” More impatience from the man-shape. After he set down the oranges, the customer plucked two bouquets and slid them into the plastic sleeves Dante handed to him. Then the man placed the flowers on the table in order to pull more bills from his wallet. “Thank you,” Dante said robotically and handed him the bouquets one at a time. The man struggled to hold the oranges as well as the flowers. The kid looked like he was about to lunge into traffic, and his dad tried to herd him with one leg. A bouquet tucked under the man’s arm began to slip. Dante lunged across the table with both hands and caught the roses before they could fall to the oil-soaked dirt of Los Angeles. “You’re a freak!” cried the kid, suddenly glued to the spot as he caught sight of Dante’s wreck of a hand. And then the kid laughed. He laughed so hard he couln’t stop. Dante’s face flamed. He shoved his hand back into its pocket and spun away from the man, who hurried to get his still-laughing kid and his stuff into his Lexus SUV. It’s just a kid, let it go, Dante thought. But he still wanted to pummel somebody’s face into the dirt. Still angry, he tidied the money in the cash box, made sure the roses had water, and restacked the remaining bags of oranges. However, no more customers came. He couldn’t help thinking his hideous weak hand had driven them away somehow. Owner Lady wasn’t going to be happy. The man in the expensive car had treated him like another child. Dante was sixteen, almost a man. But a cripple can’t be a real man. Manhood takes hands. Two of them. When the sun no longer burned his eyes, Owner Lady drove up in her van to load the day’s unsold merchandise along with the canopy and table he’d already taken down and folded. Just like Dante figured, her face hardened when she saw the many remaining oranges and roses. Dante kept a straight face. Owner Lady always called him Pokey, after poquito, because of his short stature. But poquito meant a little bit, not little. And Owner Lady thought he was too dumb to figure out that Pokey meant slow in English, or was also the name of a rubbery red cartoon horse. He made no move toward the buckets. Just two years in this country and his English was better than Owner Lady’s. Dante owned this foreign language. But he wisely kept his mouth shut. Dante couldn’t say if he looked scary or not, but he was definitely homeless. Okay, Owner Lady had one on him there. Dante knew piss all about British actors or monkeys. But he seethed at being called cute. He would rather walk through a panther-filled jungle at night. “No thank you, ma’am. But I do need money for le taqueria,” Dante told her. “Circo Rubio,” Dante muttered, “Went bust after their bus went over the cliff.” If he hadn’t been riding with the other flyers that day, he would’ve died too. Maybe death would’ve been more fun than selling oranges with a useless hand. Before he could stop them, his memories shot back to the nights he’d left audiences on their feet shouting for more. Four flips between los trapecios had been child’s play. Like a good burro, he carted the table and canopy that comprised the portable roadside stand and packed them into her van. After that, he loaded the sacks and buckets. Owner Lady drove away, leaving only Dante and a small dust devil on the side of the road. With his rolled sleeping bag and satchel, he walked six blocks to le taqueria where he sat and ate three chicken tacos with a large horchata to drink. Sated, he wrapped up the remaining tacos and went to stake out his territory for the coming night. Every night since he’d started working for Owner Lady, Dante slept in the arroyo that ran partly under the freeway. Other homeless guys, mostly loners, camped there. There was safety in numbers, if you staked out the right spot. Dante stopped at the chain link fence that ran along the lip of the arroyo. He tossed over his satchel and sleeping bag. They landed neatly on the other side, not rolling down into the canyon-like concrete riverbed. “Yo, vato.” The voice, half-contemptuous, half-friendly, came from behind him. On his guard, Dante spun around, aware of the knife stowed in his sock. He nodded at Nunez. The kid was a low rung gangbanger, but mostly those were the worst. They had something to prove. “Tired of sleeping with the winos yet?” Nunez set a hand on one hip. That was exactly how Uncle Gabriel got deported. He got busted trying to get some money for food after they’d both been let go from the meat-packing plant after Dante’s accident. “Zafo. I’m out.” Like in tag. He grinned back at Nunez, only this wasn’t child’s play. Dante cocked his head. “My uncle didn’t steal anything.” The Delgados were performing artists, not thieves. “That’s not what the boss says.” Nunez made a sign with one hand, expecting Dante to do the same as a gesture of respect. It was stupid to diss one of Fat Pedro’s boys, even a messenger minion like Nunez. But still, Dante could take down this punk bare-handed. One-handed. His pulse pounded at the sides of his neck. Dante didn’t make the sign. “Not smart, homes.” Nunez moved to withdraw an object in the back of his waistband. Dante dropped to the ground on one hand, and in a move that was part acrobat, part maniac, kicked Nunez’ arm. The gun flew to the dirt and fired. A hair-raising whoop sounded from the other side of the arroyo. Dante’s head whipped toward the noise. A clown, complete with make-up, wig, and purple and yellow costume, whizzed down the embankment on a unicycle. Stunned, Dante stared in amazement. Momentum carried the unicycle up the opposite concrete slope and right to Dante and Nunez, who both stood frozen in amazement on the opposite side of the fence. “Dante Delgado?” asked the clown, breathing hard. Dante gave a barely perceptible nod. The clown made it up over the concrete lip and stopped, balancing precariously. Arms out, his feet worked the pedals back and forth. Sweat beaded through the white mask of make-up, making him look especially horrific. “Usted payoso loco!” cried Dante, jumping backward. Also in Spanish, Nunez swore and retrieved his handgun. He looked scared enough to shoot at the blowing trash or anything else that moved. He pointed the weapon not at Dante, but at the clown. The old fool balanced on that squeaky unicycle and smiled like a freaky sonofabitch. Dante could run if Nunez was distracted enough. Mierda, Dante’s stuff was on the clown’s side of the fence. He’d lose everything if he ran. And maybe Nunez would shoot him in the back. Stupid clown. Dante made a crazy, impulsive decision. He leaped to the top of the chain link fence, which made a noise like tiny bells. “Brace yourself, old man,” he said. A seasoned circus performer is ready for anything, so Dante wasn’t surprised when the clown swiftly turned the unicycle to face the arroyo and held himself erect, arms outstretched. Dante vaulted to the clown’s shoulders as lightly as a canary landing on its perch. The impetus pushed the wheel over the concrete lip. As they sped down the embankment, wind rushed Dante’s face, making him blink, and he could think of little more than keeping his balance. Two rapid gunshots echoed down the concrete corridor, followed by the nasty ping-ping of bullets biting the cement. The clown pedaled mightily. With a quick downward glance, Dante caught flashes of purple and yellow silks as the clown’s legs rose and fell. Soon, the older man puffed and wheezed. When they were beneath the shadow of the next overpass, Dante hopped to the ground. The clown slowed, teetered, and Dante caught him before he hit the pavement. “The worst what?” asked Dante, offended. He kicked the ground in frustration. His belongings were back where he’d left them. He had nothing. Unless he went back. Chills ran up Dante’s spine, stronger than the ones he’d gotten from the pistol-packing wannabe pandillero. How’d this clown know what took place at the fruit stand? What kind of gangbanging was this Ringmaster into? “I didn’t say no magic words.” Mierda. This payoso had him frazzled enough to use incorrect grammar. Although wild-looking, this clown didn’t scare Dante the way he had Nunez. Even though the costume and make-up were oddly old-fashioned, the sight of a clown stabbed homesickness deep in Dante’s gut. He missed his family’s circus the way Lucifer must miss heaven. Angry, Dante scowled darkly at el payoso. But the clown beamed and clapped his hands together fast like a toddler or a performing seal. “Of course! Please and thank you, the magic words.” The clown found this hilarious and it was minutes before he was able to speak again. Dante shifted his feet. He’d missed all chance at a good spot under any overpass. “What’s this Ringmaster’s game?” asked Dante with a squint at the growing sunset. “El Circo,” whispered Dante. So, the Ringmaster was an actual ringmaster of a circus. The thought of stepping foot on circus grounds again filled him with exhilaration and dread. His palms sweated. If only the sweat could be his anger. His mouth tried to form a smile. No luck. He’d smile when he could once again fly on the trapeze. He flexed his mangled and aching hand hidden in his coat pocket. That would be never. The Woman Behind the Curtain. A paper big top, circus truck, and messy office. I am currently involved in my first DIY book trailer video. I have no idea what I'm doing, and while that doubles the frustration, it also doubles my fun. Progress is quite slow. The music I purchased is, IMO, perfect. And a teen thespian is on board for the voiceover. After much camera trial and tribulation, I'm shooting the thing on my iPhone 4. This is working out much better than I'd anticipated. The lack of zoom capabilities is a good thing with me at the helm. Trust me, everyone might be puking their circus peanuts if I was allowed to go all Blair Witch on this project. Here's the special effects I'm rigging up for my big-top interior shots. The cats think I tied all those quivery sequins on hangers just for them. I'm using iMovie to put everything together. Since my daughter and her friends have done many school projects on iMovie, they're helping me out. They also know the best places to upload videos. The end result will undoubtedly appear homemade, but I'm hoping in a good way. The Mumbo Jumbo Circus, after all, is a ragtag affair. Writers can spend thousands of dollars on book trailers and their impact is negligible. My negative budget (I did a trade to get $ for the music.) forces me to dig deep into the process and my own creativity, which makes the whole experience a richer one. Especially for the cats. Giveaway ends May 25, 2011. Amazon now has The Mumbo Jumbo Circus Kindle version on sale for .99. Get it while it's hot. I have no idea how long this price will last. Hey folks, the sale is over. The floor is littered with confetti and sawdust...or wait, is that...flower petals? Ah yes, the wisteria. Last year the vines and I fought a mighty battle. I say it ended in a draw, but I'm pretty sure the wisteria thinks it won. 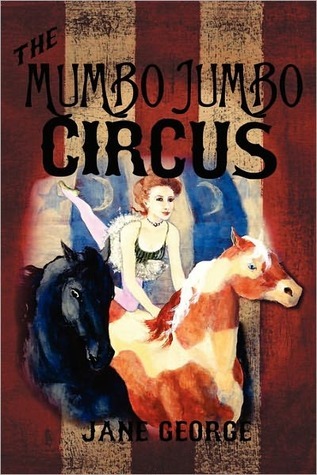 You can get The Mumbo Jumbo Circus as an eBook for $3.99, in paperback for $12.50. Click on the Home page for direct links to sellers.